Can Pusha T Turn The Public Against Drake? 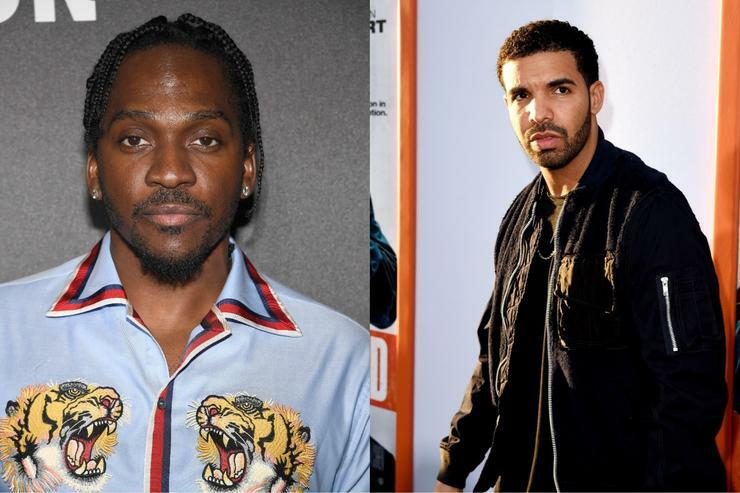 Home>Music> Can Pusha T Turn The Public Against Drake? Will Pusha T leave a lasting injury on Drake's career with "The Story of Adidon"? Or is this another example of the mundanity of beefing with Drake? So while Pusha definitely aimed high (taking some devastatingly low-blows), it’s hard to tell if he’s hit his mark just yet. If we are to believe Pusha, or, more importantly, if Pusha truly wishes to knock Drake off his pedestal, he’ll need to come with more receipts and less psychoanalysis, less shock factor and more facts - especially with how much he’s been straining to emphasize his dedication to the “truth” recently. He needs to avoid painting Drake as the perpetual underdog. It's this particular role, that of the "underdog" that seems to shield Drake from many a rap beef. We've seen disses slide right off his back, the rapper's career progressing unscathed. Lupe Fiasco has already gone to great length to give Drake a fair shake over the Jim Crow Collection he modelled nearly a decade ago. Do you remember where you were when Ice Cube dropped “No Vaseline”? I don’t - my parents hadn’t even met yet. What about “Ether”? Although I was only six at the time, and had just moved to the United States with my parents a few months prior, I know I must have heard it everywhere because that melody was seared into my subconscious by the time I was old enough to do my Googles and re-visit the Nas x Jay-Z beef. Still, neither of those two defining moments in rap beef left a lasting impression on me in the moment - I was too young. So too were many of the kids currently clamoring to Twitter to dissect the increasingly less subliminal disses that are turning a longstanding Cold War between Drake and Pusha T into something much more outwardly sinister. For fans my age and younger, you really had to be a hip-hop head, or have older siblings who were willing to put you on, to be tapped into the lesser known beefs (like, say, a Jadakiss vs. Beanie Sigel battle). We knew about Tupac and Biggie, N.W.A. and Ice Cube, Nas and Jay-Z, because we had to, but we had just missed 50 Cent going after the entire industry and the clash between Gucci Mane and Jeezy was too rated-R for our innocent eyes. Instead, all we can recall are a hazy series of Eminem disses that go at magazines, pop stars and whoever Benzino is. That’s why “Back to Back” hit so hard for so many - despite it being a whole bunch of hot air that ultimately did nothing to discredit Meek Mill’s legitimacy, it was a direct, confrontational back-and-forth that had everyone glued to their screens. And while it messed up Meek’s money for a bit, we’re now finally witnessing the lasting impact of their beef. Unfair as it may be, Drake’s authenticity in a culture dictated by respect and realness will always be questioned in a post-Meek world. Of course, depending on who’s doing the questioning, it typically won’t/doesn't matter (a symptom of the aforementioned "perpetual underdog" status?). But when a Pusha T steps up to the plate, things may not pan out as strategically for Drake as we’ve come to expect. There is no way you can expect kids under 20 to realize that Drake has gone from the brand new best friend trying to insert himself into pre-existing issues to somehow bearing the entire brunt of an age-old beef. I’m sure there’s a whole Rap Genius breakdown of it by now, but the point still stands - to many, this is just album promo and WWE entertainment. Is it fair to expect them to understand why Pusha started fanning the flames all the way back in 2011, on “Exodus 23:1”? Or why Drake felt it was necessary to interject with “Tuscan Leather” or “Two Birds, One Stone” or any of the other various subliminals over the years since? This could still all be a work for sales, with Pusha hinging this new drama on the prior beef both he and Pharrell have had with Birdman and Lil Wayne, knowing that his core fans will eat that up - the timing of it all would definitely make sense. But, something about the sheer disrespect presented on “The Story of Adidon” makes us doubt that this anything less than genuine. This may have very well been some casual sparring from Drake’s perspective too - a documented fan of battle rap and, historically, a willing benefactor of #BARS. As much as the public would like to paint Drake and Pusha as being cut from different swatches of cloth, they are both exceedingly proud men who have gone out of their way to claim their stake in the game. So the fact that we received “Duppy Freestyle” only makes sense - Drake sensed a lot of hypocrisy coming from the GOOD Music camp and decided to air it out, most likely assuming Pusha would come back with some #BARS of his and that would be that. Instead, Pusha, with just the first two lines of his response, decidedly took it beyond rap - highlighting the distinct difference in generations. He's from the era of Jay "exposing" Prodigy at Summer Jam. For someone of Pusha’s ilk, rap and real-life are one in the same. Your character in the game must be maintained outside, and vice versa. And it feels as if he knew the only way to truly go at Drake was via public perception. The way it looks right now, Pusha perfectly baited the biggest pop star in the world into thinking he could step into the ring with a master of his craft. For the first time in his career, Drake is being upstaged on the most public of platforms. But it’s the oldest trick in battle rap: just because Pusha might have revealed a bunch of dirt, we’re quick to dismiss the technical merits of Drake’s initial response while simultaneously setting the highest of bars for his inevitable comeback. Because he has to come back, right? The mundanity of beefing with Drake up until this point has stemmed from the fact that there has been no real way to knock him down a peg. As is the intent of all rap beef, those opposed to Drake, and on the side of his opposition, want to see their target actually take a blow that leaves lasting damage. While Meek wasn’t able to accomplish that himself, it is now abundantly clear that he’s sown the seeds for all future decries of Drake’s talent, character or business dealings. MUSIC Can Pusha T Turn The Public Against Drake?